Today the River had dropped back to the top of the Red Brae wall (on the webcam this shows some water coming over the armchair rock, and a good swirl on either side of it) and this meant that it was a perfect height for Tyndals Pool, which comes into its own after a spate as the water is dropping back. Today Tyndals was mine for the day. I decided the level was too high and the current too fierce to wade across at the top of the pool. Instead I decided to fish Willows through first, and then wade across at the top of that pool to the north bank and walk up the bank to the head of Tyndals. While fishing Willows I saw three fish, one of which was certainly a kelt, but, judging by their positions in the pool ( just off the point of the willows) I reckon the other two were fresh fish. Encouraged by seeing fish I started at the Armchair Boulder at the head of Tyndals (the one you see on the webcam) and fished down the pool steadily, handlining the last few feet into the slack water on the north side of the main stream. Just below the ‘elbow’ there was a long draw and the reel spoke. After a brief but lively fight I netted and returned a bright little fish of about 7lbs. As I was starting to fish again a nice fresh fish showed in more-or-less the exact spot where I hooked my fish. I then moved on down the pool, fishing a Wetcel 2 and medium fast sinking leader with about 24″ of 12lbs polycarbon cast, and a size 6 double hook Yellow Torrish. I fished the pool all the way down, past the two north bank groynes, and when I reached the dub at the very tail of the pool, with the fly swinging across the stream smoothly and at just the right speed and depth, it stopped and I tightened into a fish which for the first minute I was convinced was a kelt. I was soon to be convinced otherwise when the fish made a long run down into the Willows, ending in two lunging jumps and taking most of the backing off the reel. Big fish! It repeated the reel stripping runs three times more before gradually coming under control. After a long struggle I netted the fish which, in terms of length (36″ approx) should have been 20lbs+. Unfortunately it had the most horrendous gash in its belly which had only partly healed, but sufficiently to indicate that the wound was probably received at sea. Although the fish had no sea lice, its general condition was just about OK, although it was probably 6-8lbs underweight as a result of its injury. I estimate its weight to be about 14lbs. Judging by the length and depth of the wound I would be surprised if the fish had not been severely curtailed in feeding after the predatory attack. I thought about killing the fish on the grounds that there was very little prospect of its surviving to November or December to spawn, but decided that there was sufficient doubt, despite its poor condition, to justify returning it to the river alive. I just hope that it makes it to the redds. This is the second fish we have caught this year at Finavon with severe damage almost certainly caused by sea mammals of one species or another. The most encouraging thing about today was the number of other fish I saw on Milton Beat. Today the sun shone all day long and the snow water kept coming. In these conditions, with the water temperature rising, there was always a good chance of a fish. The water was hardly fished in the morniong but this afternoon two of us covered the main pools for what almost certainly was a transient run of fish stopping for short periods in their migration upstream. This 9lbs fish came from the dub in Tollmuir Pool and was caught by Derek Strachan. With the river purling down after two days of serious thaw in the hills, the expected spring run is appearing, albeit in dribs and drabs. My guess is that with all this water, gradually warming up in air temperatures of 15C plus, the salmon will soon be in the upper river. I see that a fish was caught yesterday at Inshewan, and Bill Balfour told me of an absolute beauty (18lbs) caught at Upper Kinnaird on Saturday. We had two fish today: a trim little seven pounder in Willows and a cracking 10lbs fish to Ian Ingledew in the Marcus House Pool – his first spring salmon! The week is shaping up well with a lovely clean snowmelt to draw new fish into the system. We are now putting rods on the Water each day, which is something we have not done in March for years. In other words, the fishing effort at Finavon is about to ratchet up a few clicks, and, provided water levels remain good, we should continue to catch salmon. If we were to reach 10 fish by the end of March, it would be a sign to me that the spring run is far from dead, and that is something I have felt might be the case for some time, without the benefit of evidence I admit. 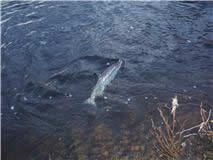 The fact is that you won’t see catches if there’s no-one fishing, and catch statistics are based on rod-caught salmon. It’s a Catch 22 situation, but perhaps even more zany than that excellent book! One other point about the South Esk. We are told by SNH that our freshwater mussels (one of the species targeted by the SAC status) are in trouble. Why is it then that, after the winter floods every year, there are masses of shells of these molluscs of all sizes (ie ages) scattered along the riverbanks? My guess is that the big beds of Margaritifera margaritifera (the biological name of the freshwater mussel) have been missed by the SNH field staff. If I were guessing, I would say that there are plenty of these molluscs in the stretch of river between Justinhaugh Bridge and the A90 bridge at Finavon. Why else would we see such copious quantities of spent shells each spring? All this – the guess work applied to measuring spring salmon stocks and to the abundance of the freshwater mussel – indicates to me that no-one, least of all our decision makers, has much of an idea of the biological inventory of the South Esk. Not a good basis for decision making: it needs to improve.